The Jaguar Clubs of North America (JCNA) is dedicated to the wide range of Jaguar motorcars old and new, and the American, Canadian and Mexican enthusiasts who love them. 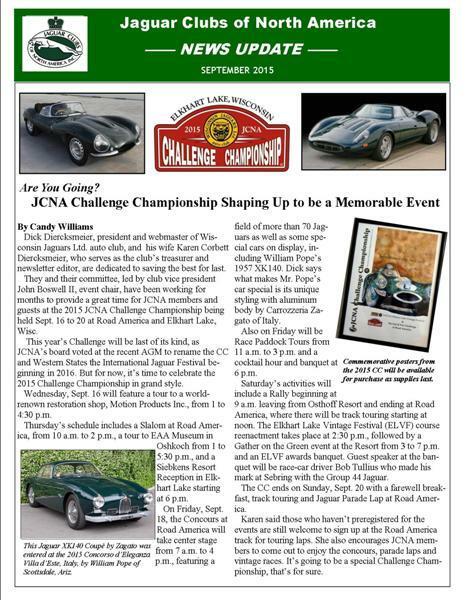 Incorporated in 1954, JCNA has become the hub of Jaguar enthusiasts from Canada, Mexico, the United States and around the world. As a social organization with a common interest in the Jaguar marque, JCNA strives to provide members with the widest range of services and activities for those with an enthusiasm for all Jaguars, both old and new. We find that the entire family participates in many events because activities span a large cross section of interests. JCNA is not just limited to competitions and shows. Many other activities that individual clubs have initiated range from exclusive showings of the latest Jaguar model to group vacations! Our members own from the rarest to the latest Jaguar cars, while some do not yet own a Jaguar at all. We welcome anyone with an interest in Jaguar cars to become part of our family. Download at this link or purchase your printed copy here. Click on the date to open the most recent E-Newsletter.